The Island, by Hotel RL plays host to some of the area's largest events. From business retreats to wedding exhibitions, The Island on Okaloosa Island is the perfect home for an event of all sizes! This is why it was chosen as the location for Emerald Coast Con 2018! Now in its 5th year, Emerald Coast Con is expecting its largest crowd yet. With an all-ages atmosphere offering games, activities, costume contests and more, Emerald Coast Con on Okaloosa Island is a must-do event for even the most casual of gaming and technology fans! Looking for accommodations during Emerald Coast Con 2019? Check out places to stay on Okaloosa Island! Get a dose of nostalgia with exciting exhibits at Emerald Coast Con. Cosplay contests bring our favorite characters of film and fiction to life, and gaming rooms allow players young and old to come together in appreciation of our hand-held history. Retro Arcade & Console Room - Button up your acid wash jean-shorts and return to the days where a roll of quarters was more valuable than gold! 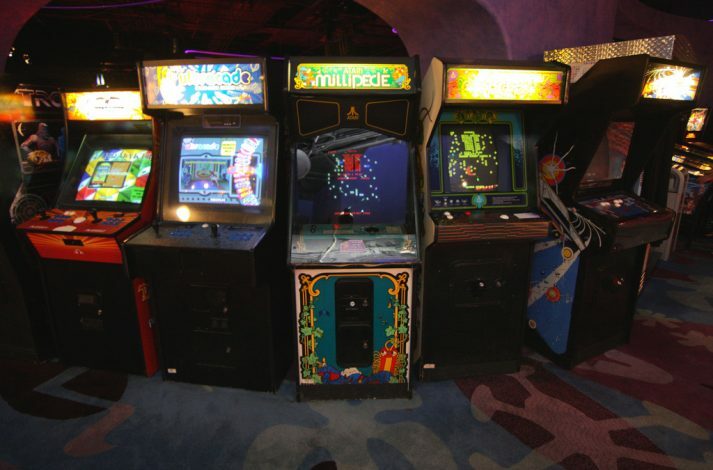 In Emerald Coast Con's Retro Arcade Room, ticket holders are allowed FREE PLAY on all machines, which include such memory-rousing titles as Teenage Mutant Ninja Turtles, Simpsons: The Arcade Game, and Street Fighter 2! Before your fingers turn blue from button mashing on arcade Donkey Kong, head over to the Retro Console Room. The 1,200sq ft hall is fitted with history's greatest gaming consoles. From your parents' Atari to Playstation 2, relive the golden days of gaming at Emerald Coast Con! Some of the classic and rare consoles include Atari, NES, Super Nintendo, N64, GameCube, Sega Master System, Sega Genesis, Sega Saturn, Dreamcast, Playstation 1 and 2, Xbox, NeoGeo, and Turbo Duo. Cosplay Contests - Cosplay contests are a fun and creative way to get involved in Emerald Coast Con. Categories for children, adults, beginners, and experts are available, with cash prizes for winners! Show the world your best Batman, or imitate your favorite gaming characters like Mario, Link, or Lara Croft! Learn more at the Emerald Coast Con Cosplay Guide including contest schedule and how to register. The Gulfarium Marine Adventure Park is located walking distance from the The Island, by Hotel RL. Visit the Gulfarium Marine Adventure Park for family friendly marine exhibits, shows, and animal encounters! Video Games Old & New! One of the main draws to Emerald Coast Con are the casual and professional gaming tournaments. With such popular past titles like Super Smash Bros, Street Fighter, and Mario Kart, gaming tournaments allow players to display their talents on a major stage! Along with professional tournaments taking place both days of the convention, just-for-fun tournaments in the Retro Arcade and Console rooms allow video gamers of all skill levels to take part in the fun. Cash prizes will be awarded to contestants of the Emerald Coast Con's video game tournaments! Well-known gamers, video game creators, cosplayers and more will be featured at this year's Emerald Coast Con. Two days of panels include heavy-hitters in the video game industry, as well as high-powered gaming and tech enthusiasts. Check out some of the previous Emerald Coast Con guests. Catherine West (GAME DEVELOPER) - This indie game hero hails from the great state of Florida! With next-level skills and ingenuity, Catherine landed herself a job as Lead Programmer of Starbound. This ground-breaking video game put Catherine West on the map, and she's ready to share her experiences with Emerald Coast Con guests at her 2017 panel! Dino Andrade (VOICE ACTOR) - If you don't already know Dino, you certainly would recognize his versatile voice. Best known for his role as the Scarecrow in Batman: Arkham Asylum, Dino Andrade has voiced some of our favorite characters from the Gnomes of World of Warcraft, to Snap, Crackle, and Pop in the Rice Krispies commercials. Pick the brain of this acclaimed voice actor at the Emerald Coast Con! Little Red Fox Cosplay (COSPLAYER) - An accomplished seamstress and costumer from Mobile, AL, Little Red Fox has gained popularity for her innovative designs that continually challenge her skill and artistry. Part of Causeplay Gulf Coast, Red is a superstar in the cosplay world for her philanthropy and position as a positive role model. *Proceeds of Emerald Coast Con go to benefit the Arc of the Emerald Coast charity foundation.